Phosphate is a fundamental nutrient for all creatures. It is thus not surprising that a single bacterium carries different transport systems for this molecule, each usually operating under different environmental conditions. The phosphonate transport system of E. coli K-12 is cryptic due to an 8 bp insertion in the phnE ORF. Here we report that an E. coli K-12 strain carrying the triple knockout ΔpitA Δpst Δugp reverted the phnE mutation when plated on complex medium containing phosphate as the main phosphorus source. It is also shown that PhnCDE takes up orthophosphate with transport kinetics compatible with that of the canonical transport system PitA and that Pi-uptake via PhnCDE is sufficient to enable bacterial growth. Ugp, a glycerol phosphate transporter, is unable to take up phosphate. 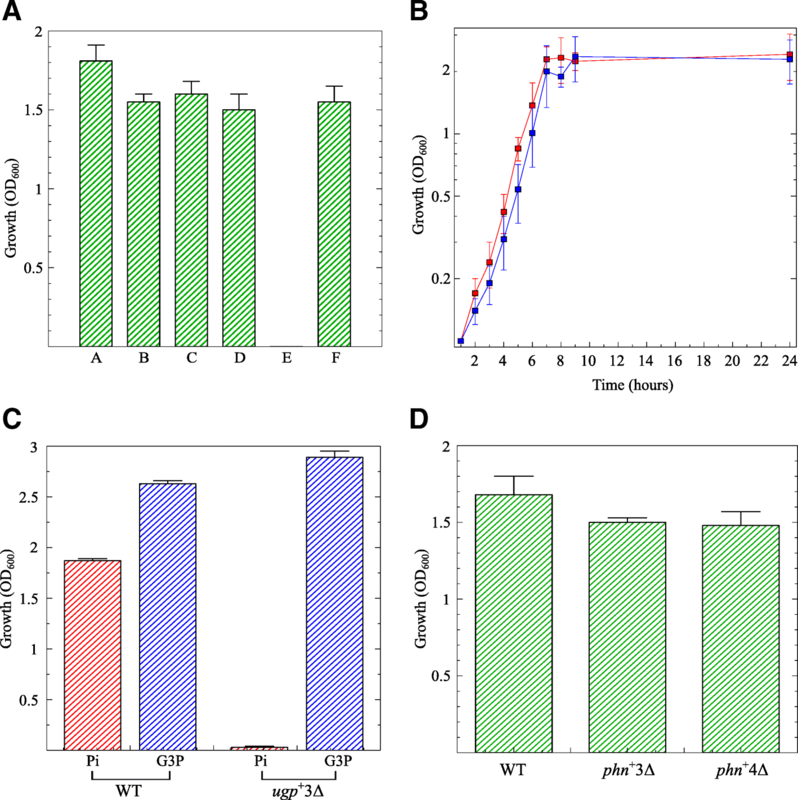 The phosphonate transport system, which is normally cryptic in E. coli laboratory strains is activated upon selection in rich medium and takes up orthophosphate in the absence of the two canonical phosphate-uptake systems. Based on these findings, the PhnCDE system can be considered a genuine phosphate transport system. The online version of this article ( https://doi.org/10.1186/s12866-019-1445-3) contains supplementary material, which is available to authorized users. Raffaele Stasi and Henrique Iglesias Neves contributed equally to this work. Phosphorus is a macronutrient of utmost importance to all living beings. It is thus not surprising that bacteria developed several different mechanisms of phosphorus acquisition. Particularly, the PHO regulon, a set of genes involved in the acquisition and metabolism of phosphorus containing molecules in response to phosphate (Pi)-shortage in the medium is present across bacterial phyla. The PHO regulon of E. coli comprises more than 30 genes . The most well characterized genes of the PHO regulon are phoB-phoR, the operons pstSCAB-phoU, ugpBAEC, phnCDEFGHIJKLMNOP and phoA that respectively encode the two-component system that controls the transcription of the regulon, an ABC-type Pi-transport system, an ABC-type glycerol phosphate transport system, a 14-gene operon involved in phosphonate (Pn) transport and assimilation and a periplasmic alkaline phosphatase (AP). Genes belonging to the PHO regulon are synchronously induced by Pi-shortage . For the sake of simplicity, the operons pstSCAB-phoU, ugpBAEC, phnCDEFGHIJKLMNOP will be respectively shortened to pst, ugp and phn. Most, but not all available phosphorus in nature is in its most oxidized state (+5), also known as phosphate. Phosphonates (P valence +3) are phosphorus-containing organic molecules in which the P atom is linked directly to C in a stable chemical bond. Though less common in nature than organic phosphates, many Pn molecules, such as the antibiotic fosfomycin and the herbicide glyphosate are of clinical and environmental importance [3, 4]. The first three genes of the phn operon - phnCDE, encode an ABC-type Pn transport system. The polypeptide products of phnC, phnD and phnE respectively are an ATP-binding subunit, a periplasmic binding protein and a Pn permease. The next gene, phnF encodes, based on sequence similarity, a negative regulatory protein that represses Pn transport via PhnCDE. The remaining ten genes of the operon (phnGHIJKLMOP) code for enzymes involved in Pn catabolism, such as a C-P lyase complex. Owe to the presence of an 8 bp insertion in phnEE. coli K-12 strains do not express the PhnE permease and consequently are unable to take up phosphonates . However, phnE+ revertants that arise by spontaneous slippage [5, 6] are relatively easy to select by growing bacteria with Pn as the sole phosphorus source or by growing bacteria in Pi-limited medium for several days [5, 6, 7]. The vast majority of E. coli strains and isolates carry a functional phnE gene. E. coli possesses three Pi-transport systems - PstSCAB (Pst), PitA and PitB. Pst is an ABC-type high-affinity system formed by four proteins: the Pi-binding periplasmic protein PstS, the integral membrane proteins PstC and PstA, and the ATPase PstB. The pst operon belongs to the PHO regulon and responds to Pi-limitation. In addition to its role in Pi uptake, the Pst system also acts as a repressor of the PHO regulon under Pi-excess conditions . PitA and PitB are metal-phosphate symporters that share 81% sequence identity. The former is likely constitutive, while PitB is inhibited by the PHO regulon  and is not functional under Pi-starvation or in a PHO-constitutive background, i.e., in a pst mutant [9, 10, 11]. Based on the ability to grow in media containing different phosphorus sources, Metcalf and Wanner  suggested that Phn is able to take up Pi, phosphite and Pi-esters. However, the bacterial strains used in that study were not fully characterized and the role of the PhnCDE system in Pi transport was not further confirmed. By characterizing a spontaneous Phn+ revertant in E. coli K-12 carrying knockouts in genes related to Pi transport we unequivocally show that Phn has the ability to take up Pi in the absence of canonical Pi-transport systems and to support the growth of bacteria lacking another functional Pi-transport system. It is also shown that despite previous suggestions, the Ugp system is unable to transport Pi. PHO-constitutive mutants can be isolated by plating wild-type bacteria on glycerol-2-phosphate (G2P) as the sole C source. 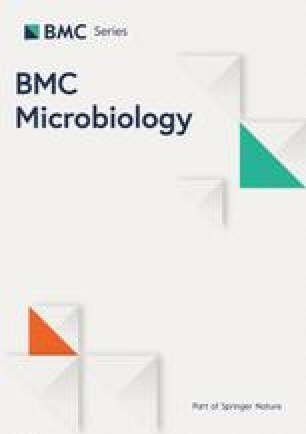 We have previously observed that the frequency of such mutants in bacteria carrying both ΔpitA and Δugp knockouts is extremely low . This is because as most PHO-constitutive mutations occur in one of the five genes of the pst operon, a ΔpitApst strain would lack a functional Pi-uptake system and will thus not be able to grow with Pi as a phosphorus source. Furthermore, most G2P, which could in principle be utilized as a Pi source , is hydrolyzed to glycerol and Pi in the periplasm by the constitutively expressed AP, while the remaining intact G2P cannot be taken up due to the absence of Ugp or another G2P-transport system. Nevertheless, a small number of ΔpitA Δugp spontaneous pst mutants could be isolated on G2P, suggesting that the triple mutant acquired a fourth mutation that enabled growth in this medium. To further investigate this matter, we attempted constructing a ΔpitA Δugp Δpst triple mutant in the wild-type K-12 strain MG1655 by means of recombineering and transduction. Individual deletions obtained by λ-red mediated recombineering were transduced one after another into MG1655 (see Methods). While all pairwise combinations could be easily obtained, attempts to originate the triple mutant were mostly unsuccessful. In one of these attempts, Δpst was transduced into the ΔpitA Δugp double mutant and the selective plate (L-agar containing kanamycin) was inadvertently kept at 37 ∘C for 72 h. A single colony emerged after 72 h which, once isolated was able to grow in LB and in minimal medium containing Pi as the sole P source. Genome sequencing of this bacterium (strain RI57) revealed the deletion of 8 bp (5’-GCTGGCGT) at position 407-414 of phnE ORF. In addition to the three knockouts (Δpst ΔpitA Δugp) and the phnE 8 bp deletion, other point mutations in the genome of strain RI57 were observed (Table 1). One of them is a G insertion in glpR ORF, which encodes the repressor of the glycerol-3-phosphate regulon . Some variants of strain MG1655 are glpR- while others, like the one used in this study carry a wild-type copy of this gene . With the exception of the 1 bp insertion in glpR none of these substitutions is apparently connected to the PHO regulon or to Pi metabolism. The 8 bp deletion in phnE was subsequently confirmed by Sanger sequencing. The ability of the triple knockout ΔpitA Δpst ΔugpphnE+ (strain RI57) to grow in LB medium that contains 2.2 mM Pi as the main phosphorus source  suggests that the PhnCDE system might be involved in the uptake of Pi in the absence of a viable Pi-transport system. To investigate this assumption a set of bacterial constructs was generated. First, the phnE+ allele was transduced from BL21, an E. coli B strain to MG1655 (strain RS03), then the ΔpitA, Δugp and Δpst deletions were sequentially transduced to MG1655 phnE+ originating strain RS07 (phn+3 Δ). In parallel, a phnCDE deletion was constructed and transferred to each one of the following double mutants: Δugp Δpst, ΔpitA Δpst and ΔpitA Δugp resulting in strains RS04 (pitA+3 Δ = pitA+ Δpst Δugp Δphn), RS05 (ugp+3 Δ = ugp+ ΔpitA Δpst Δphn) and RS06 (pst+3 Δ = pst+ ΔpitA Δugp Δphn), respectively. The new constructs were tested for overnight growth in minimal medium with 1 mM KH 2PO4 as the sole phosphorus source (Fig. 1a). As expected, bacteria carrying either PitA or Pst grew almost as well as the wild-type strain. In the absence of both PitA and Pst, only the strains that possessed a functional PhnCDE system managed to grow. This includes the spontaneous ΔpitA Δugp ΔpstphnE+ revertant (strain RI57) and the phnE+3 Δ transductant (strain RS07). The ugp+3 Δ triple mutant (strain RS05) carrying a functional Ugp system did not grow in this medium. To further investigate the ability of the PhnCDE system in supporting growth in the presence of Pi as the only phosphorus source, the phn+3 Δ triple knockout (strain RS07) and the wild-type strain MG1655 were set to grow in medium TGP (1 mM Pi) for 24 h (Fig. 1b). It can be observed that the growth rate of the phn+ triple mutant at the exponential phase (µ = 0.52 h-1) was as fast as that of the wild-type strain (µ = 0.46 h-1), suggesting that PhnCDE can take up Pi at a rate that enables maximal growth rate. The only triple deletion that did not grow in medium TGP was strain RS05 (ugp+3 Δ), which suggests that the Ugp system is unable to transport Pi. To exclude the possibility that the ugp operon in this strain has acquired a spontaneous null mutation, the wild-type strain and the triple mutant ugp+3 Δ were grown in minimal medium supplemented with either Pi (TGP) or G3P (TGG3P) as phosphorus sources. Figure 1c shows that the growth yield of strain RS05 (ugp+3 Δ) in medium TGG3P was slightly higher than that of the wild-type strain, while in the TGP medium the ugp+3 Δ mutant grew very poorly. This indicates that strain RS05 (ugp+3 Δ) carries a functional Ugp system. We also investigated whether the pitB gene, that encodes a PitA-like Pi-transporter that is normally nonfunctional in wild-type E. coli or in a PHO-constitutive mutant  was spontaneously activated enabling the growth of the phn+3 Δ triple mutant (strain RS07) in TGP. To test this possibility the pitB gene was deleted from strain phn+3 Δ resulting in the quadruple mutant phn+ ΔpitA ΔpitB Δpst Δugp (strain RS08 = phn+4 Δ). Figure 1d shows that both strain RS07 (phn+3 Δ) and RS08 (phn+4 Δ) grew in medium TGP, suggesting that PitB is not functional and confirming that the PhnCDE system is able to support growth with Pi as a phosphorus source. Next, Pi uptake assays were performed in the wild-type strain MG1655, and in the triple knockouts phn+3 Δ (strain RS07) and ugp+3 Δ (strain RS05). Bacteria grown in medium TGP or TGG3P to an OD 600 of 1.0 were washed to remove any phosphorus leftovers and exposed to 0.2 mM 32P(KH 2PO4). Figure 2 shows that the rate of Pi uptake in strain RS07 (phn+3 Δ) was similar to that of the wild-type strain, while the ugp+3 Δ (strain RS05) failed to take up significant amounts of Pi. To further characterize the PhnCDE system the kinetic parameters of Pi uptake via Phn and PitA were obtained. The triple mutants phn+3 Δ (RS07) and pitA+3 Δ (RS04) were exposed to increasing concentrations of 32Pi and assayed for Piuptake. The kinetic parameters of Pi-uptake for strains RS07 (phn+3 Δ) and RS04 (pitA+3 Δ) were calculated from a Lineweaver-Burk double reciprocal plot (Additional file 1: Figure S1). The Vmax and Km of PhnCDE (strain RS07) were, respectively, 76.25 nmol Pi/min/mg protein and 19.46 µM Pi, while that of PitA (strain RS04) were 99.98 nmol Pi/min/mg protein and 25.99 µM Pi. Wilsky and Malamy  have reported for PitA a Vmax of 55 nmol Pi/min/mg protein and Km of 38.2 µM Pi. Altogether, these data indicate that the kinetics of the PhnCDE transport system towards Pi is very similar to that of the PitA transporter. The uptake of Pi by PhnCDE was also validated by competing Pi with aminoethylphosphonate (AePn). Bacteria were exposed to 10 µM 32Pi and 50 s later an excess concentration of AePn (4 mM) was added. Additional file 1: Figure S2 shows that addition of AePn strongly inhibited Pi uptake when compared to the control which received no AePn. Lower concentrations of AePn resulted in less transport inhibition (data not shown). Finally, we assayed Pi consumption throughout a bacterial growth curve. Strains MG1655 and RS07 (phn+3 Δ) were grown in medium TGP containing 1 mM Pi as the sole phosphorus source. At 1 h intervals, samples were taken for growth assessment (OD 600) and residual Pi in the medium. Additional file 1: Figure S3 shows that the patterns of growth and Pi-consumption were very similar in both strains throughout the entire curve. In both cases, almost all Pi was exhausted after 24 h. These results indicate that Pi uptake via the PhnCDE system continues for several hours as efficiently as in the wild-type strain. The data presented here show that in the absence of a canonical Pi-transport system, PhnCDE confers on bacteria the ability to take up Pi and to grow as fast as the wild-type strain. The functional redundancy of three different Pi-transport systems (PitA, Pst and Phn) attests for the importance of Pi as a vital macronutrient. However, it should be noticed that each one of the aforementioned transport systems play, at least one additional role or function. PitA is a symporter of Zn 2+ and other divalent cations  and Pst is a repressor of the PHO regulon . Thus it is not surprising that Phn possesses more than one physiological role, namely transport of phosphonates, Pi and perhaps of other phosphorus-containing molecules . The PhnCDE transport system in E. coli K-12 is normally cryptic, due to an 8 bp insertion in phnE ORF . Deletion of the 8 bp insertion restores the reading frame and activates phosphonate transport via PhnCDE. Thus the 8 bp deletion observed in our ΔpitA Δpst Δugp transductant was likely to cause the reactivation of PhnCDE. Selection of phnE+ revertants has been reported before in bacteria plated on minimal medium with phosphonate as the sole phosphorus source [5, 6] and by serial transfer of a wild-type strain growing in low Pi minimal medium [7, 20]. Of the four tested transport systems, only Ugp was unable to support growth and take up Pi. In a previous study, we have shown that the emergence of PHO-constitutive mutants on plates containing glycerol-2-phosphate (G2P) as the sole carbon source partially depends on the presence of Ugp . The hypotheses raised to explain this phenomenon were that Ugp was required for the uptake of either G2P or Pi. The finding that Ugp is unable to take up Pi indicates that the contribution of Ugp to the emergence of PHO-constitutive mutants is likely to be associated with the uptake of G2P . It should be noted, however, that the ability of Ugp in transporting G2P is still unsettled, as genetic evidences showed that Ugp transports G2P , while in vitro, UgpB, the periplasmic binding protein, did not bind this molecule . An early report suggested that E. coli’s PhnCDE is able to take up Pi . This assertion was based on the growth of strain BW4794, which when plated on phosphite or phosphonate acquired the ability to grow on both phosphorus sources and also on Pi. However BW4794 was a poorly defined mutant that carried a partial pst deletion and another undefined linked mutation. The fact that this strain was not clearly shown to be pitA-negative adds uncertainty to the identity of the transport system used for Pi uptake. To the best of our knowledge, since that publication the ability of the PhnCDE system of E. coli to transport Pi was not further tested and confirmed. There were, however, some hints that the PhnCDE system might be involved in Pi transport. Rizk et al. reported that E. coli PhnD (the periplasmic binding protein) displays a relatively small affinity towards Pi (Kd = 50 µM). The PhnDCE system of Mycobacterium smegmatis was shown to transport Pi but not phosphonates  and the PhoCDET Pi transport system of Sinorhizobium meliloti transports both Pi and phosphonates . By sequentially deleting all known Pi transport-related genes we clearly demonstrated that Phn takes up Pi in sufficient amounts to support growth with Pi as the sole phosphorus source. It was also shown that reversion of the phnE mutation could be selected by plating the triple knockout ΔpitA Δpst Δugp on rich media, such as L-agar. This medium contains 2.2 mM free Pi  and possibly limiting concentrations of organic phosphates. Under these conditions, the triple knockout ΔpitA Δpst Δugp cannot grow unless by reverting the phnE insertion. Bacterial strains used in this study are depicted in Table 2. Unless otherwise specified, bacteria were incubated at 37 ∘C under aerobic conditions. LB/L-agar is the standard rich medium . Minimal medium was composed by T-salts (0.12 M Tris-HCl, 80 mM NaCl, 20 mM KCl, 20 mM NH4Cl, 0.98 mM MgCl2.6H2O, 2.46 mM Na2SO4, 2 mM CaCl2, 2 µM FeCl3, 2 µM ZnCl2, pH 7.5) supplemented with glucose (11 mM) and 1 mM of the following P sources: KH2PO4 (TGP) or a glycerol phosphate isomeric mixture (glycerol-3-phosphate + glycerol-2-phosphate) (TGG3P) . Gene and operons were deleted using the λ-red recombinase system as originally described by Datsenko and Wanner  and Murphy et al. . Briefly, the cat or kan resistance cassettes were amplified from plasmids pKD4 or pKD3, respectively, using the following pairs of DNA oligos: ugp350 and ugp4480 for deletion of ugpBAEC; pitA_mut_Fow and pitA_mut_Rev for deletion of pitA; pitB_mut_Fow and pitB_mut_Rev for deletion of pitB; pst_mut_Fow and pst_mut_Rev for deletion of the pstSCAB-phoU operon; and phn_mut_Fow and phn_mut_Fow for deletion of the phnCDE genes. The amplicons containing the cat or kan cassettes were electrotransformed in strains KM44 or KM32. 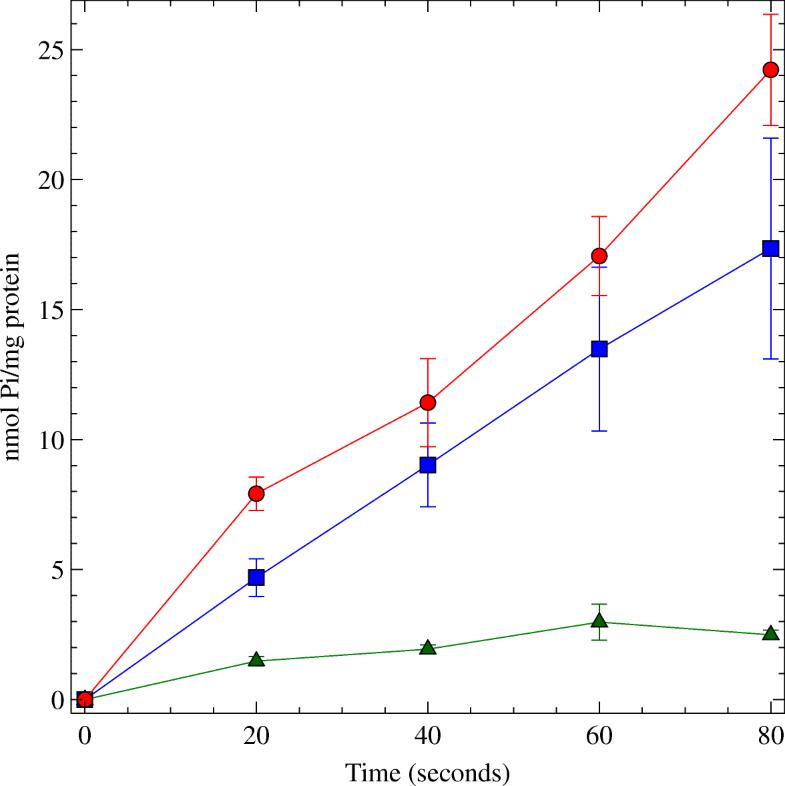 To induce the λ-red genes the bacterial cultures were supplemented with 1 mM of IPTG. Selection of recombinants was done by plating on L-agar supplemented with chloramphenicol or kanamycin. Knockouts of pitA, pitB, phn, pst and ugp were confirmed by PCR using primers pitA_ver_Forw/pitA_ver_Rev, pitB_ver_Forw/pitB_ver_Rev, phn_ver_Forw/phn_ver_Rev, pstS_S_Fow/phoU_S_Rev and ugp858/ugp52101 and, when applicable, by phenotypic assays, such as AP activity  or growth on phosphonates. The deletions were transferred to strain MG1655 by P1 transduction. The antibiotic resistance marker (kan or cat) was eliminated from the recombinant chromosomes by transformation with the temperature-sensitive plasmid pCP20 as described . Transfer of chromosomal markers using P1 transduction was performed as described . Knockout transductants were selected on L-agar plates containing either kanamycin or chloramphenicol. Selection of the phnE+ allele transductant (from strain BL21 to MG1655) was in minimal medium plates containing 2-aminoethyl-phosphonic acid as a phosphorus source. Genomic DNA from strain RI57 was extracted using the Wizard Genomic DNA purification kit (Promega) following the manufacturer instructions. Quantification of DNA as well as sample integrity and purity was assessed using a QuBit dsDNA BR kit (Thermo Fisher) as specified by the manufacturer. For library construction, DNA was fragmented in a Covaris ultrasonicator and library preparation was performed as specified by Illumina Mi-Seq protocols. Sequencing was performed in an Illumina Mi-seq sequencer at the Centro de Facilidades de Apoio a Pesquisa (CEFAP-USP). Genome sequence was assembled and annotated using as reference the genome sequence of strain MG1655 (gi = 556503834 ref = NC_000913.3). The draft genome sequence of strain RI57 was deposited at DDBJ/EMBL/GenBank under the accession number CP032679. Local sequencing was performed by the Centro de Estudos do Genoma Humano (CEGH) at the Universidade de São Paulo. Amplicons produced by PCR using oligos phn_seq_Fow and phn_seq_Rev were purified using a Wizard PCR purification kit (Promega) and DNA sequencing was performed by the Sanger method using the BigDye terminator version 3.1 Cycle Sequencing Kit (Applied Biosystems) and analyzed in a ABI 3730 DNA analyser. Bacteria were grown to the early exponential phase (OD ∼0.15), washed with 0.9% NaCl and resuspended in the same volume of TG medium (TGP lacking KH 2PO4). For the Pi uptake assays of MG1655, phn+3 Δ and ugp+3 Δ a solution of 200 µM KH 2PO4 mixed with 1 µCi 32P was used. To obtain the kinetic parameters of Pi-uptake of strain RS07 (phn+3 Δ) and RS04 (pitA+3 Δ) KH 2PO4 solutions of 5, 7.5, 10, 15 and 20 µM and 15, 20, 30 and 50 µM were, respectively, prepared. The “cold” KH 2PO4 solutions were mixed with 1 µCi 32P. The 32P(KH 2PO4) solutions were used to start the uptake assay. At several intervals after the addition of 32P(KH 2PO4), 500 µl of the bacterial cultures were withdrawn, filtered under vacuum through a cellulose acetate filter (0.22 µm) and washed with 5 ml of a TP solution (T-salts + 10 mM KH 2PO4) to remove the unincorporated 32Pi. The filters were then move to vials filled with scintillation cocktail (Optiphase Hisafe 3, Perkin Elmer) and the radioactive content of each sample was measured in a β-counter. The wild-type strain MG1655 and strain RS07 (phn+3 Δ) were grown in medium TGP containing 1 mM KH 2PO4. Samples were taken hourly for assessing the OD600 and residual Pi in the medium. Pi concentration in the culture medium was measured as described . The supernatants of the bacterial cultures were collected, diluted 100 times and mixed with the same volume of the working reagent (1 volume of 167 mM H 2SO4, 1 volume of 2.5% (NH 4) 2MoO4, 1 volume of 10% ascorbic acid and 2 volumes of deionized water) and incubated at 37 ∘C for two hours. Following the incubation period, samples were measured in a spectrophotometer at 820 nm. Calibration solutions were prepared with the following concentrations of NaH 2PO4: 0.16 mM, 0.08 mM, 0.04 mM, 0.02 mM and 0.01 mM. We thank Luiz Gustavo de Almeida and Ingrid Reale Alves for helping sequencing the genome of strain RI57. We also thank Vinícius Sousa Flores for helping with the Pi-uptake assays. We are grateful to Fundação de Amparo à Pesquisa do Estado de São Paulo (FAPESP) for supporting this study. RS and HIN were supported by FAPESP scholarships. B.S. is a recipient of a productivity scholarship from the Conselho Nacional de Desenvolvimento Científico e Tecnológico (CNPq). The draft genome sequence of strain RI57 is available at DDBJ/EMBL/GenBank under the accession number CP032679. The datasets used during the current study are available from the corresponding author upon request. RS and HIN performed all experiments. BS conceived, designed the study and wrote the manuscript. All authors read and approved the final manuscript.